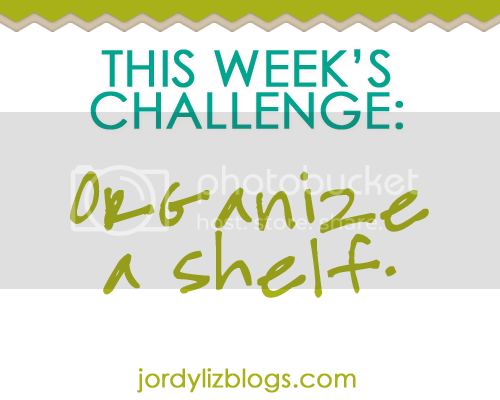 Jordy Liz Blogs: Organizing life: Week four challenge. Organizing life: Week four challenge. Make sure to link up your challenges for this last week! Let's get going on week four. You'll have a week to complete this next challenge and you can come back on Tuesday, June 26 to link up. This can be any shelf in the house. For me, it will be the bookshelves. Since the shelf is out in the open, what do I want seen? What can be placed elsewhere? What can I give away? I think it will be tough to stick to just one shelf but I'm going to give it a try!